THIS MASSIVE 2000-PLUS CLASSICS SHOW WILL STILL FEATURE ALL THE USUAL THINGS FOR THE DISCERNING CLASSIC CAR ENTHUSIAST. ONE OF THE UK’S BIGGEST AND MOST POPULAR CLASSIC CAR EVENTS FEATURING MORE THAN 90 FIRST-CLASS CLASSIC AND PERFORMANCE CAR CLUB DISPLAYS, MORE THAN 300 PRIVATE ENTRIES OF THE HIGHEST STANDARD AND A MASSIVE 250-PLOT AUTOJUMBLE, GENERAL AND TRADE AREA! By paying the park entry charge you are contributing to the cost of conserving and maintaining Tatton Park for you and future generations to enjoy. Every penny spent at Tatton Park, whether it is the £7 park entry, admission to attractions, or spend in the shops and restaurant, helps to maintain the park. Tatton Park car and minibus entry fee applies to all visitors, including national trust members. The Passion for Power Classic Motor Show is a powerhouse event in the UK classic car events scene, famous for the unique and eclectic mix of powerful performance cars with rare and exciting vehicles featured every year. Showgoers can experience the gathering of these world-famous vehicles twinned with the excitement of the huge autojumble that’s on offer. 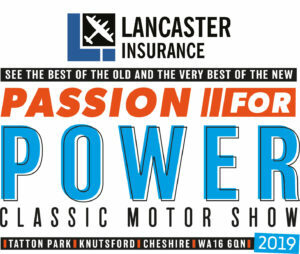 The Passion for Power Classic Motor Show is a great day out for the whole family, including refreshments, beer tent, food bars, kiddies’ rides and live entertainment. Don’t miss this highly acclaimed classic motoring event at Tatton Park. Come down to Tatton Park, August 17 – 18 to get in on all the fun. For all eligible cars: Exhibiting at our shows is free of charge! Our August event will also feature our superb showstopper… ‘The Passion For Power – Dream Cars Pavilion’… See below for a list of superb supercar attractions on display at this year’s show!! A large undercover display area for the finest high-performance, competition and supercars! With increasing numbers of high-quality, high-performance cars attending our mid-summer event we have decided to create an area of suitable prominence for these magnificent vehicles to be shown at their very best. Whether privately owned cars, club stand exhibits, or high-end dealer displays, this 1000-SQ-M-Plus pavilion will be crammed full with the rarest, most exotic and exciting cars! More than 70 concours trophies on each show day ensure a very high standard in the display areas, and with more than a dozen club stand awards on each day too, this show can truly boast that its club displays are quite possibly the best in the UK! Entry conditions: Exhibit and trade areas are limited, therefore all entries are at the sole discretion of the organisers. Please note: All show exhibits must be pre-booked. For further details regarding exhibit entries please refer to contacts page. All participants must ensure they have adequate insurance cover for the activity they take part in. CELEBRATING MORE THAN 30 YEARS OF CAR SHOW EXCELLENCE!